Hemophilia can be briefly defined as an inherited congenital coagulation disorder found in blood. There are 2 types of hemophilia, which are based on deficiencies of the blood clotting factors: Hemophilia A results from a deficiency in factor VIII (FVIII) and hemophilia B results from a deficiency in factor IX (FIX). Hemophilia A is the most common form of the disease, affecting 80% to 85% of all patients with hemophilia, and is found in approximately 1 in 5000 male births.1 FVIII and FIX are crucial to the coagulation process of blood, which is caused when a strong platelet plug, covered by a stable fibrin clot, forms in damaged blood vessels to stop bleeding. When there is a lack of clotting factor proteins, weak platelet plugs are formed along with incomplete, possibly delayed, fibrin clots. This can result in continued bleeding from the damaged blood vessels. Treatments for hemophilia began to emerge in the 1930s after it was discovered that human blood could be separated into its constituent parts, specifically plasma and red blood cells.3 Plasma contains FVIII and FIX along with proteins (albumin, gamma globulin, and anti-hemophilic factor), minerals, salts, sugars, fats, hormones, and vitamins. Therefore, the frozen plasma that could be extracted fresh from human blood samples became the earliest treatment method for hemophilia A and B. This collected plasma was used as direct replenishment for patients with a known condition of diminished clotting factor levels. After the discovery of fresh frozen plasma (FFP), a breakthrough method, cryoprecipitate, was developed by Judith Graham Pool, PhD in 1964.2 Cryoprecipitated plasma was used to prepare FVIII, fibrinogen, von Willebrand factor, and factor XII from FFP. Dr. Pool’s method for this collection helped advance the use of factor concentrates, which were freeze-dried clotting factors kept as powder (quite easier for storage) and reconstituted prior to administration to patients. Today, treatment for hemophilia focuses on replacement therapy. Conventional replacement therapy is the process of replenishing the deficiencies of clotting factors by using clotting factor concentrates.4 Treatment for severe hemophilia has shifted from primarily the management of acute episodes of patient bleeding to treatment by prophylaxis, with the introduction of recombinant clotting factor products. Mild to moderate hemophilia is generally managed with clotting factor products during acute bleeding episodes only. Extended half-life products readily allow for prophylaxis treatment and, furthermore, a decreased need for intravenous administration. Additionally, clotting factor products can be either derived from plasma or a recombinant, based on their method of manufacturing. The recombinant factor (rF) products are genetically engineered and allow for unlimited production of blood products. Eptacog alfa (NovoSeven) is a recombinant factor VIIa (FVIIa) product most commonly used for bleeding events in patients with hemophilia A and hemophilia B, along with inhibitors. Other emerging therapies include non-factor replacement products. 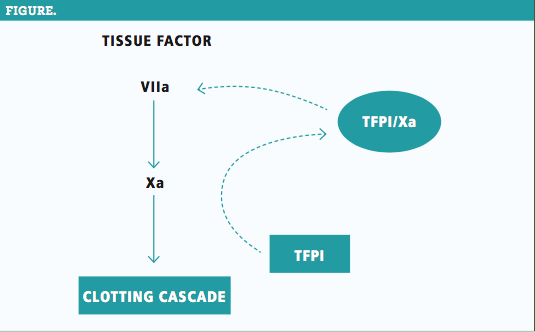 These are generally bispecific antibodies that mimic the clotting factors, such as FVIII (emicizumab [Hemlibra]), while inhibiting anti- thrombin and/or TFPI. DDAVP is a synthetic analogue of the natural pituitary hormone known as 8-arginine vasopressin.14 DDAVP stimulates the release of stored FVIII and von Willebrand factor, making this a viable treatment option for patients with a mild classification of hemophilia A.4 Antifibrinolytic agents are most often used with replacement therapy. These agents are typically administered prior to minor surgeries, such as dental procedures, to prevent bleeding events. Although the leading treatment for hemophilia is a replacement therapy in the form of both plasma-derived and rF products, research is underway for the discovery of novel agents. These agents utilize different molecular drug targets, genes, and proteins involved in the process of a clotting cascade. The results are promising and have generated reasonable optimism that a pathway toward a cure for hemophilia may exist in the near future. Balkaransingh P, Young G. Novel therapies and current clinical progress in hemophilia A. Ther Adv Hematol. 2018;9(2):49-61. doi: 10.1177/2040620717746312. Hemophilia of Georgia. The Hemophilia, von Willebrand Disease & Platelet Disorders Handbook. https://www.hog.org/handbook/article/1/3/severity-levels. Accessed August 13, 2018. Patek AJ, Taylor FHL. Hemophilia. II. Some properties of a substance obtained from normal human plasma effective in accelerating the coagulation of hemophilic blood. J Clin Invest. 1937;16(1):113-124. National Heart, Lung, and Blood Institute. Hemphilia. NHLBI website. www.nhlbi.nih.gov/health-topics/hemophilia. Accessed August 13, 2018. Peyvandi F, Garagiola I, Biguzzi E. Advances in the treatment of bleeding disorders. J Thromb Haemost. 2016;14(11):2095-2106. doi: 10.1111/jth.13491. A Trial Evaluating the Efficacy and Safety of Prophylactic Administration of Concizumab in Haemophilia A and B Patients With Inhibitors. clinicaltrials.gov/ct2/show/NCT03196284. Accessed August 13, 2018. A Study to Assess Pharmacokinetics and Pharmacodynamics Following Administration of BAY1093884 in Patients With Severe Hemophilia. clinicaltrials.gov/ct2/show/NCT03481946. Accessed August 13, 2018. FDA grants breakthrough therapy designation for BioMarin’s valoctocogene roxaparvovec (formerly BMN 270), an investigational gene therapy for hemophilia A [press release]. San Rafael, CA: BioMarin; October 26, 2017. Accessed August 13, 2018. Single-Arm Study To Evaluate The Efficacy and Safety of Valoctocogene Roxaparvovec in Hemophilia A Patients. clinicaltrials.gov/ct2/show/NCT03370913. Accessed August 13, 2018. FDA approves emicizumab-kxwh for prevention and reduction of bleeding in patients with hemophilia A with factor VIII inhibitors. FDA website. www.fda.gov/drugs/informationondrugs/approveddrugs/ucm585650.htm. Accessed August 13, 2018. Oldenburg J, Mahlangu JN, Kim B, et al. Emicizumab prophylaxis in Hemophilia A with inhibitors. N Engl J Med. 2017;377(9):809-818. doi: 10.1056/NEJMoa1703068. A Study of Emicizumab Administered Subcutaneously (SC) in Pediatric Participants With Hemophilia A and Factor VIII (FVIII) Inhibitors. clinicaltrials.gov/ct2/show/NCT02795767. Accessed August 13, 2018. Hemlibra (emicizumab-kxwh) [prescribing information]. www.fda.gov/medwatch. Accessed August 13, 2018. DDAVPP injection (desmopressin acetate) 4 mcg/mL [prescription informaiton]. Bridgewater, NJ: Sanofi-Aventis; 2007. products.sanofi.us/ddavp_iv/ddavp_iv.pdf. Accessed August 13, 2018.